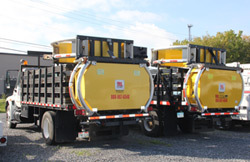 TRL is proud to provide Scorpion Truck Mounted Attenuators (TMA) to help protect your crews when working roadside. These low profile, curved, modular designed units redirect side angle impacts aware from truck and any other personnel that may be in the path of an oncoming vehicle. We have units. 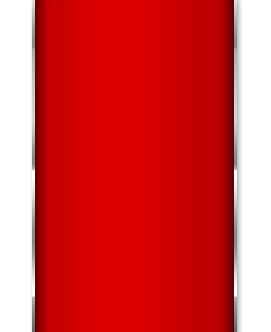 An impact attenuator, also known as a crash cushion or crash attenuator, is a device intended to reduce the damage done to structures, vehicles, and motorists resulting from a motor vehicle collision. Impact attenuators are designed to absorb the errant vehicle's kinetic energy and/or redirect the vehicle away from the hazard,and from roadworks machinery or workers. 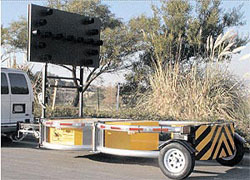 Our fleet included Scorpion & Trinity crash attenuators with arrow boards. These units are designed to provide an attenuator solution that can be towed and attached to an 10,000 lb. 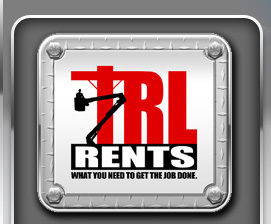 host vehicle with a 20,000 lb pintle hitch without having to modify the host vehicle. An impact attenuator, also known as a crash cushion or crash attenuator, is a device intended to reduce the damage done to structures, vehicles, and motorists resulting from a motor vehicle collision. Impact attenuators are designed to absorb the errant vehicle's kinetic energy and/or redirect the vehicle away from the hazard,and from roadworks machinery or workers. 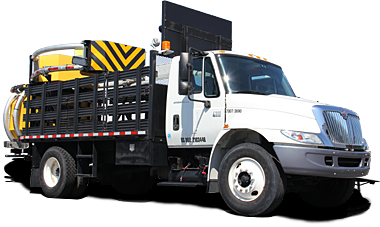 Our fleet included Scorpion & Trinity crash attenuators with arrow boards.